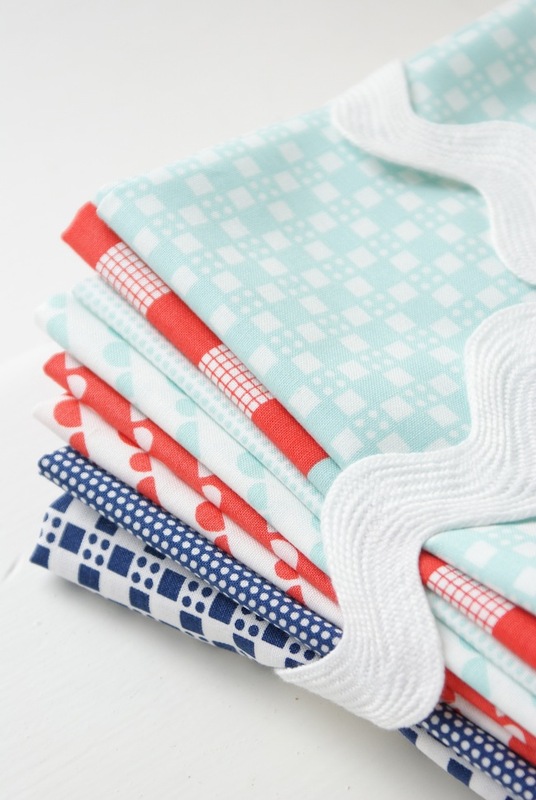 MessyJesse - a quilt blog by Jessie Fincham: Shop News! 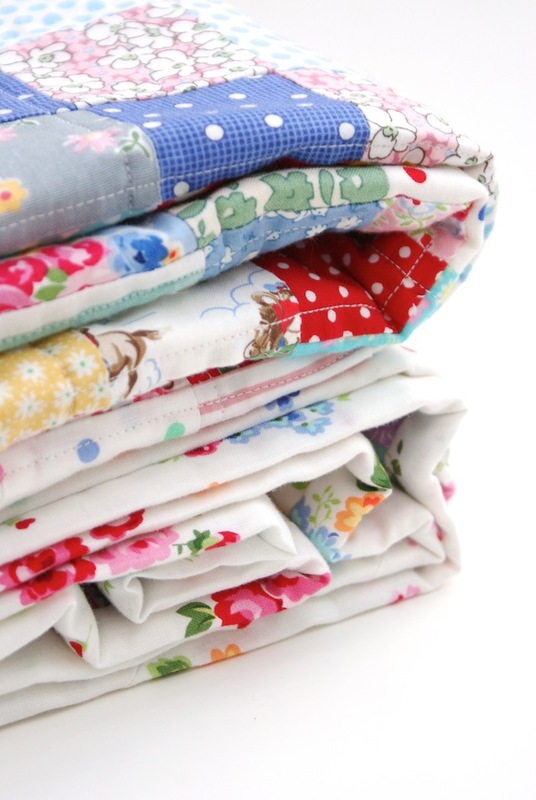 I thought today I would share with you some of the lovely fabrics that have been pouring into Sew and Quilt this last month, as it seem I never write dedicated posts about my shop!? 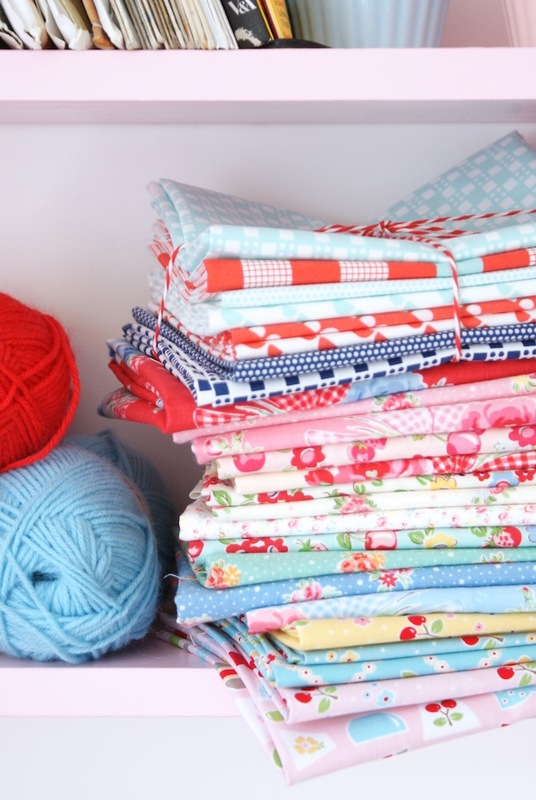 If you're not into pictures with piles of fabrics, look away now! First up is the beautiful Old/New 30's by Lecien, they really are so pretty and the photo's don't do it justice unfortunately. I haven't got round to cutting into these yet but I'm thinking a simple, vintage nine-patch style like this would be great for them, don't ya think? Another exciting collection we received is Bake Sale by Lori Holt, it's so bright and fun! 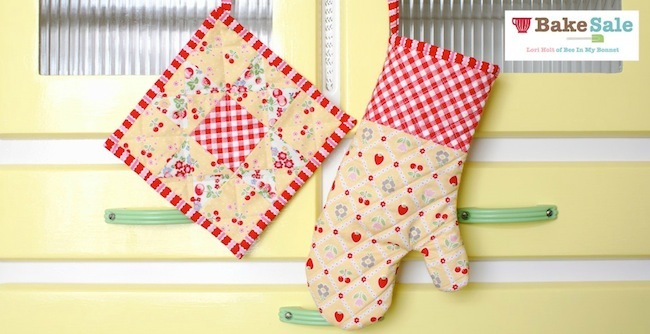 I whipped up a potholder and matching oven mitt with these over the weekend, and it works so well in my kitchen. I have a big yellow 1950's kitchenette cabinet, so I tied in the yellow cherry print to match perfectly! :) they make me smile every time I see them. 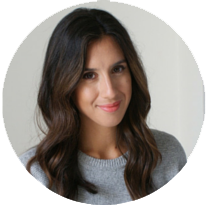 And last but certainly not least, we have some of the fabulous Happy Go Lucky collection by Camille Roskelley. 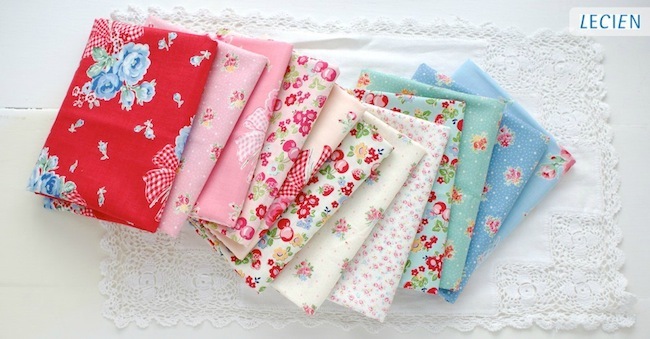 The colour's are so amazingly bright and cheery in real life and they blend so well with lots of different fabrics. I've just started a bit of a giant quilt challenge on the weekend, using *alot* of the aqua penny dots print, I can't wait to share more on that with you soon! I love the scallop prints too, perfect for binding, yeh! In the past I have received some lovely comments from my blog readers about my Scrappy Trips quilt, and some people had asked me if I could put together a quilt kit for them. At first I was a little reluctant, I was worried it wouldn't be quite what they expected as fabrics wouldn't be identical, or I would not give them enough fabric by error. But after a few more queries I decided to go ahead and make a bunch of scrappy trip quilt kits (now say that two times fast!!). After some quilt math and lots, and *lots* of checking and measurements, and cutting later we got all the kits together and I'm happy to say they've been a big hit! Thank you to all my customers who have purchased one, it's really exciting to think people want to make a scrappy trip quilt like mine! :) I'm hoping to make some more quilt kits in the future, perhaps a St Louis 16 Patch next? ha ha , you know i can't wait !! have you got a Flickr group where people can put stuff that they have made from your fabric? Drool... ;-) Lovely, lovely fabrics, all of them. And I do so love your Scrappy Trip quilt too. I've just made one in bright colours as a gift for a friend, but think my next one definitely has to be in pretty pastels. I'm not surprised your kits are flying off the shelves! I think those Old New 30s fabrics would be lovely in a St Louis 16 patch. They are divine!